Every breed of dog comes with drawbacks that we must accept as owners. It could be their size, how much they shed, physical requirements or limitations, or even the likelihood of developing genetic disorders. Knowing what you’re getting into, before you get into it however, can save you thousands of dollars and tons of heartache. While you might love the looks and personality of a specific breed, you have to be honest with yourself as to whether or not you are capable of providing the dog with its required maintenance and if they honestly fit into your lifestyle. Perhaps the best example of this honest assessment that I’ve read can be found in an article by Dr. Patty Khuly entitled "This Veterinarian’s Love-Hate Relationship with French Bulldogs." In the article, Khuly outlines why she loves the French bulldog so much – their personality, looks and cuddle-ability among them. She’s also honest about how she’s come to own several over the course of more than a decade – primarily, owners that couldn’t afford the upkeep on dogs with severe issues, including cleft palate, dermatological problems and an emergency c-sections. Before you blame the high-cost of veterinary care on greedy doctors, understand that the price tag of vet school is disproportionately outpacing today’s market. This is a discussion I’ve had with veterinarians young and old all across the country; vets emerging from school nowadays will likely carry school-loan debt for vast majority of their careers. Among the most common issues Khuly lists for Frenchies are: the need for routine ear, eye and wrinkle cleaning, skin and ear diseases, respiratory issues, heat and exercise intolerance, spinal diseases and behavior problems (relating to stubbornness, a trait shared with the English bulldog, a breed which I’ve owned for 13 years and can attest to its stubbornness). In addition to those items, Frenchies are haunted by four genetic mutations: two mutations of progressive retinal atrophy, cone-rod dystrophy 4 cataracts; and degenerative myelopathy. While all dogs suffer from some sort of breed-specific physical or genetic issue, the people that knowingly breed them can help reduce the instances of these issues and can even, eventually, produce lines free of many disorders. By carefully selecting breeding stock that doesn’t suffer from the physical issues, they’re less likely to produce puppies that experience problems such as cleft palates, skin disorders or skeletal problems. Genetic testing of parents can all but eliminate puppies affected with mutations found in the breed. Taking an honest look at your lifestyle and the breed-specific demands and shortcomings of a dog – both physically and genetically – before you bring one into your home can save you money and the heartache of making tough decisions down the road. 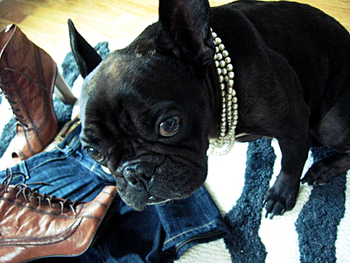 sam edelman boots french bulldog, CC courtesy of Maegan Tintari on Flickr.